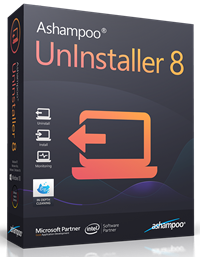 I must admit that I am a bit biased in my views regarding the Ashampoo Uninstaller line of software. I have been using them for years and highly recommend them to anyone who is interested in keeping their computers cruft-free. When Windows uninstalls a program it can leave behind a lot of remnants in its wake in the form of Registry entries, files, and folders. These are all useless, take up unnecessary disk space, and can even potentially slow down your computer. Compound these problems over years of installing/uninstalling software and you get the idea. Ashampoo Uninstaller can eliminate all this remaining garbage by performing a thorough removal of your software– something Windows was never designed to do. Uninstaller 8 installs on your computer system just as you would expect from a quality program from a trusted source. There are a few questions to answer during the installation, but nothing to get excited about. There is an automatic 10-day trial period offered so you can try-before-you-buy, or if you already have a license, you can click the link labeled Enter key manually. The price for this software at the time of writing is discounted from $39.99 to $20 (US). After installation, I was pleasantly surprised to see that there was already a free update available that fixed a few minor issues. It shows me that Ashampoo is on top of their software by making sure you get a bug-free experience. This was immediately offered after the installation and I accepted. It was a brief and painless affair. If you don’t have an Ashampoo account set up, then you will be asked to create one. Whenever I begin using a new program, I like to check the settings. You never know what you’ll find in there and it’s a good idea to check out the default behavior. You can gain access to the Settings Menu by clicking the indicated Gear Icon in the upper-right of the Main Window. Another thing to note here is that this Uninstaller program has the ability to run constantly in the background. Its purpose is to monitor any software you might install and to log any changes it makes to your system. I generally don’t like to have little-used background software running and for this reason, it is kept disabled on my system. If you should decide to install a program, you can always manually run Uninstaller 8 to log the installation for you. The advantage here is that a record of all the changes made to your system are logged and can be used to better completely uninstall the software at a later time. You can sort the list by varying criteria based on the Column Headers. To sort by installation date, for example, simply click on the Installed on header. 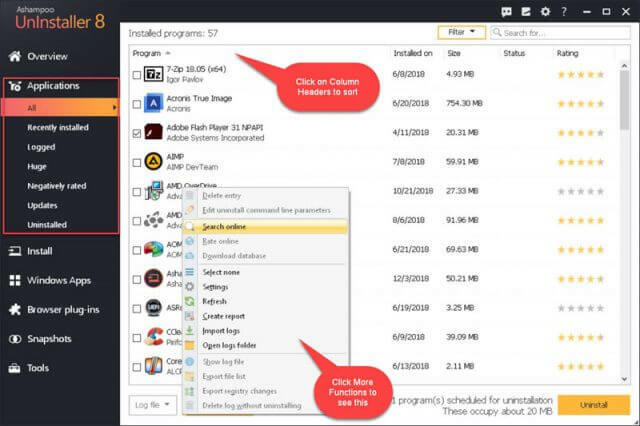 Once you choose a program by checking the box next to its name, you can click on a More Functions button which offers many more options than are available in the usual Windows Programs and Features utility. 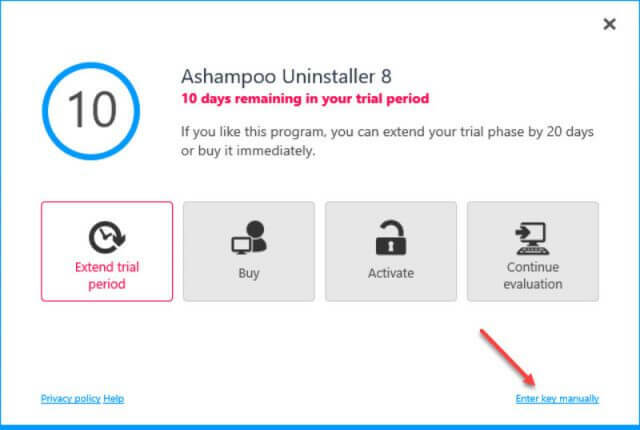 Once you have made your choice(s), simply click on the Uninstall button to begin the process. You can choose more than one program in order to uninstall them in bulk. Five Universal Windows Programs (UWPs) — I dislike the slang, “Apps” — were chosen in the above example and were sorted by Size. After clicking the Uninstall button, they had all magically been removed in a few seconds. Quick and easy! Great fun! Note: Be careful about removing these UWPs. Some rely on others to operate properly and it’s not always readily apparent which ones need the others. My constant lament is to tell you to make backups and there is no reason for me to change now– make a backup of your system before uninstalling these programs. There is no need to bore you with a complete list, but I should touch upon Browser Plugins and Tools. Browser Plugins does exactly what you would expect. It provides a list of your browser plugins and gives you the choice of uninstalling them. You can list them by an individual browser, or see all of them at once. …and the list goes on, but that should give you an idea of how complete this program is. Ashampoo Uninstaller 8 lives up to my expectations. 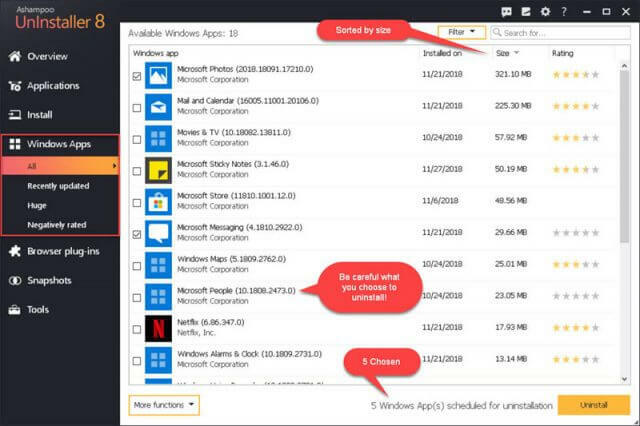 It is fast, easy to use, and provides some extra tools to help you manage your computer system in a more sensible manner than what Windows provides on its own. For these reasons, I highly recommend this program to anyone interested in keeping their computers running smoothly and who want their systems running as well as they possibly can. You are on the mark with positive comments about Ashampoo Uninstaller. I have used it over a long period of time and it performs in every way as a good uninstall program should perform. I have many Ashaampoo products which also perform as they should, and paying for them to bypass ‘freebies’ is an added benefit. Thank you for another well-written recommendation. It would bot be the first time Ashampoo buys and rebrands software from other companies, e.g. PDF Pro and Offcie are definiely not in-house productions. If I knew that hey are basically the same product, I would not hesitate to take the next opportunity for an IObit freebie. I am unaware of a relationship between these two companies. That does not mean there isn’t one. I have had poor experiences with IOBit software in the past. Maybe they’ve upped their game since then? I don’t the answer to that question, either. 1. Is it possible to test an uninstall operation by indicating just how complete it is? Can one look in the file system and the registry to determine what items were missed? Otherwise, how would one know how good an uninstaller is? One might, somehow, get a snapshot of the registry, install a program, indicate the changes (added, changed, and deleted items), then uninstall the program. Do this twice, uninstalling once with the built-in uninstaller, then again with Ashampoo uninstaller. 2. I’d like to see test results for Ashampoo uninstaller and its competitors (Revo and CCleaner come to mind). 3. Developers must know how to create an installer for their programs. Howcome they don’t just naturally create successful uninstallers? 1. You could certainly spend days testing/comparing uninstallers to see which ones do the most thorough job. Or, you could be happy knowing that anything works better than the built-in Windows uninstaller. At the very least, a good uninstaller should remove leftover files. The better ones should also clean out remnants in the Registry. 3. All developers want is to get the product out the door. Leaving a trail of junk behind does not seem to be a major concern of theirs. Coding takes time; time is money. 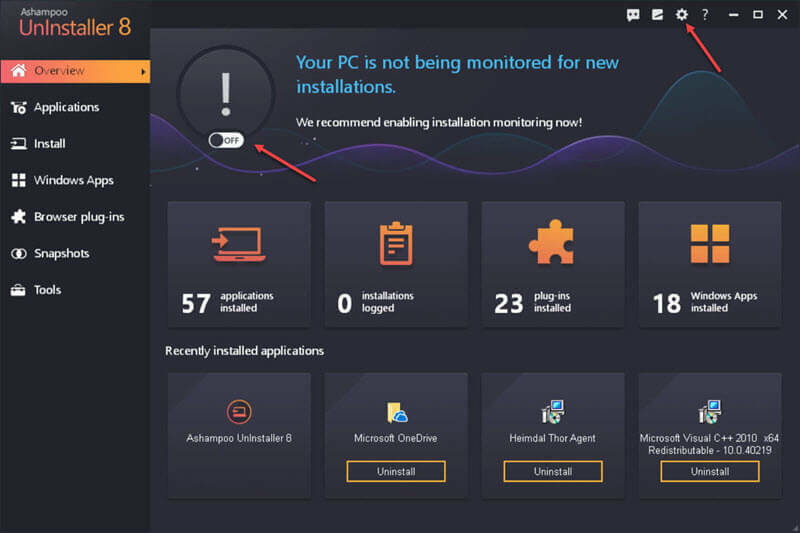 As a highly experienced computer ‘geek’ of many years I wish to tell Bob Stromberg that Ashampoo Uninstaller is far superior to CCleaner and Revo. Thank you, JoninOz, for your comment. Bob. Which versions did you compare? Look forward to your reply, Mindblower! Good review and explanatory. I’ve been using Ashampoo Uninstaller and whole-heartedly agree on all counts. I always launch it, then click to Monitor Install before ANY new software installation and love the bonus features included here. Along with this, I love all of the Ashampoo offerings. Great software at fair prices. I installed a giveaway version of ashampoo uninstaller recently. Version 7. I thought I would try it as i use Revo and Smarty Uninstaller. I have also tried Total Uninstall and a few others. The ashampoo uninstaller wiped out all the bookmarks in my browser (Chrome) immediately after installation. They were there one minute and gone the next. Uninstalled this and would be hesitant to try it again. That’s incredible! I would be “on the phone” with Tech Support about that one.